You might recognise the bra on the left from my previous blog post– it’s the vertically-seamed version of the 3-part cup Chloe bra by Fauve that I’ve just reviewed, in Mink. 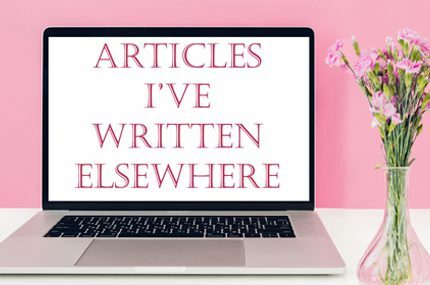 And, you might remember seeing the bra on the right too – the Heiress balcony style bra by Fleur of England – because I reviewed that not too long ago here. So this is actually my first Splurge or Save? post where I’ve actually bought both items and can recommend one or the other based on personal experience. Let’s start with the differences. The Fleur of England Heiress bra is made from a luscious silk satin with thick guipure embroidery. It also has sheer tulle panels which is something the Fauve bra doesn’t have and adds another layer of interest to the design. It’s available in 32B – 36DD. The Fauve Chloe bra on the other hand isn’t made from silk, but the fabrics are high-quality nonetheless – a super soft polyester and a thick, gorgeous Swiss embroidery. It’s on sale so many sizes are sold out, but this particular colourway is still available in sizes between 32DD and 38F. So, to splurge or save? These are both beautiful, well-made bras and I can highly recommend the two. However, on this occasion I’d have to recommend the Fauve one purely due to the fact that it’s such a great deal. These bras are really rather similar but with the Fauve a sixth of the price, if it’s just the general look you’re after and you’re not desperate for silk, I’d say go for that one. 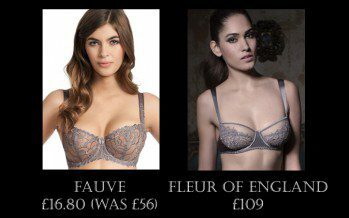 Which of these bras would you buy, the Fleur of England Heiress or the Fauve Chloe? Fauve has been discontinued for a few seasons now so it’s not really a viable alternative. Definitely a good idea for anyone who likes it to buy right away though, since it’s gone out of production.